The new and improved Remington 597 magazine! We know the picture is of a silver magazine but the color is actually black with a new improved coating but Remington hasn't provided the new pictures yet. Holds 10 rounds of .22 LR. Good magazine at a good price. .22 is notorious for feed problems, but so far the only feed problems I've seen out of these mags has been operator error. B.D. I bought my 597 years ago and haven't shot much because it had the 2nd generation mag which wouldn't feed unless it only had 5 rounds and even then it wouldn't work half of the time. I got one of these new mags and have cycled about one hundred rounds through it without a problem. The only problem I have with it is that I have to slam it into the receiver for it to lock other than that it's perfect. I just bought my rifle a few weeks ago and I thought I hated it. I had the second generation magazine in it. Rarely made it throgh a whole clip without jamming at least once. I just bought a third gen clip and shot about 100 rounds last night and never jammed once. I will definately buy more of these clips. Now I can't wait to get the other toys I ordered for my gun. Remington has made 3 different magazines for the 597. Only the 3rd generation magazine is reliable.The 1st one was plastic and bad. The 2nd one was metal and still was poor. The 3rd one was the best, and is different from the 2nd by a few things. The plastic base is thicker than the 2nd. The bottom of the base says model 597, instead of model 597 22 lr that is on the 2nd one.I more thing is on the side it has #10 circled, and the 2nd generation has no circle just 10. 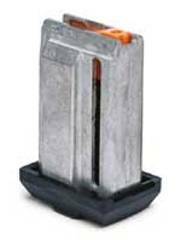 Remington has fixed the majority of their feeding problems with their 3rd magazine. These magazines are great. I bought a new 597 and it came with a plastic magazine. The gun jammed every other shot. I called Remington and they sent me a metal one, and I noticed better results. I also found that when I switched from Remington ammo to Federal, jamming was maybe one round in a hundred. I need more metal mags!! !